Lake Cowichan Part of the BC Adventure Network. Over a million web site visitors annually ! Lake Cowichan and the surrounding region is a growing, vibrant community. Cowichan Lake is one of the largest bodies of fresh water on Vancouver Island, BC. The lake is located 20 minutes (31 kilometers) west of Duncan along Highway 18. The Cowichan Lake region includes the villages of Youbou, Caycuse, Honeymoon Bay, Mesachie Lake, and The Town of Lake Cowichan. The Town of Lake Cowichan is situated on Cowichan Lake with the beautiful Cowichan River flowing through the center of town. 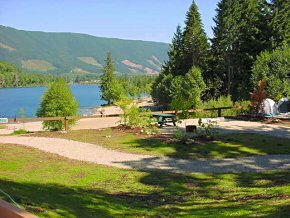 Nearby communities are within easy reach by road, and have access to scenic Cowichan Lake. 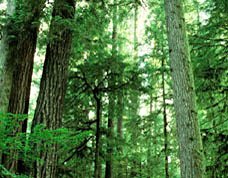 Secondary roadways provide access to Port Renfrew, Nitinat and Bamfield, which are the trailheads for the West Coast Trail unit of the Pacific rim National Park Reserve and the old growth forests of Carmanah Walbran Provincial Park. Past Cowichan Lake's eastern shoreline is some of the most spectacular outdoor adventures available on Vancouver Island. From the town, the forests of the Carmanah-Walbarn are only 2 1/2 hours away, and Gordon Bay Provincial Park is less than a half-hour away with great camping available. The area's temperate climate makes the Cowichan Lake region ideal for outdoor activities all year round. 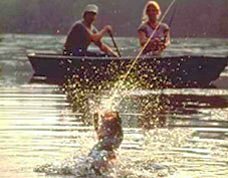 The 26 mile long lake has excellent trout fishing, water sports, boating, camping, houseboating and swimming - a marina, and boat launch are also available. Around Lake Cowichan's shore is a network of nature walks. The Trans Canada Trail's two routes on former railway lines out of Lake Cowichan follow the Cowichan River into the Duncan Area. One goes north of the Cowichan River to the Duncan Area and then north to Nanaimo. The other goes south of the Cowichan River to the Duncan Area, then goes west of the Malahat Range to Sooke and then onto Victoria, BC. The later intersects with some of the provincial parks on the Cowichan River and the historical Cowichan River Footpath. The Cowichan Valley Demonstration Forest, located along the lake, also provides an outdoor classroom of forest management. The Cowichan Lake area usually experiences warm, dry summers and mild wet winters. Over 85 per cent of rainfall occurs between October and April with December being the wettest month. July is the sunniest month with 235 hours, while August is generally the warmest with an average daily temperature of 25 C.
Youbou is nestled on the sunny side of the lake and provides both mountain and lake activities. Honeymoon Bay is situated on the south arm of Cowichan Lake and boasts an average summer maximum temperature of over 24 degrees C, the highest in Canada. Mesachie Lake is home to a BC Forest Research Station. Visitors can easily access trails planted with trees in various stages of growth. An identifying guide to trees in the area can be found on the wooden map at the park on Bear Lake Road. Caycuse is a former logging camp and copper mine on the south shore of Cowichan Lake. This was once an active, bustling community. Annual events to take in include the fabulous Lake Days Festival in June with a parade, soap box derby, river sports, log carvings, live music, a town picnics and much more. In September enjoy the Salmon and Mushroom Festival. Celebrate the �Wild Edible� treats of the Cowichan Valley � Mushrooms and Salmon, a perfect combination! Be sure to take in the Lake Cowichan Farmers Market on Saturdays in the town square; Ts'uubaa-asatx. And come join us for ourChristmas parade and many other events throughout the year. The Cowichan Lake Tourist Info-Centre is housed in Saywell Park in the heart of the Town of Lake Cowichan. The visitor info-centre is open from the May Long Week End until Labour Day. Monday to Sunday 10:00AM � 4:00PM. Be sure to check with visitor information about logging activity and logging road etiquette. Behind the Info-Centre are the Kaatza Station Museum and Historic Bell Tower School. Ample parking and a covered picnic area are available for the use of both residents and visitors alike. Saywell Park is adjacent to the Cowichan River.